Failing to prepare both physically and academically for basic military training is just careless and shows a lack of understanding of what you are about to endure as a possible career for what could be a significant part of your life. It also shows a lack of initiative, a quality you will learn you need in the military. Start practicing now. As the saying goes, "Failing to prepare is preparing to fail." You don't have to study a thing in advance in order to graduate from Air Force Basic Military Training (AFBMT). The Air Force already knows that you are capable of learning, because you're at least a high school graduate, you passed the Armed Forces Vocational Aptitude Battery (ASVAB), and you impressed your recruiter enough to get into the Air Force. However, you'll quickly find out during AFBMT that there is never enough time to get everything done that you're expected to do. That's a universal rule of basic training. The more studying you do in advance, the less time you will have to spend "in the books" studying during basic, and the more time you will have to do those other 20-dozen things that just have to get done, in order to avoid having a big, ugly scary person making the rest of you day miserable. During basic, pretty much everybody in the world outranks you. The Air Force has two separate rank structures -- enlisted and officers. Enlisted folks have stripes (the more stripes, the more rank), and officers have bars, leafs, and stars. Officers always outrank enlisted folks, no matter how many stripes are on the enlisted person's shoulders. Before you graduate from Basic Training, you'll have to memorize all Air Force ranks. So, why not know them before you ever arrive? This article explains the Air Force rank system. As a minimum, you should memorize the rank insignia (stripes or bars/leafs/stars), and their names. Drill means marching, or sometimes it means just standing in place in an organized and disciplined way. You'll do a lot of drill in basic training. 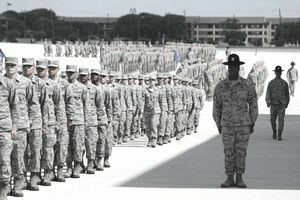 For the first couple of weeks, you'll spend an hour or two every single day learning and practicing drill, and pretty much everywhere you go in basic, your flight (recruits you are living with) will march to. Your life in basic will be easier if you learn some of the fundamentals of drill before you even get there. As a very minimum, you should learn how to salute, and practice saluting in front of a mirror, until you have it down pat. All military organizations have a chain of command. A chain of a command is who is in charge of who. In the military, if you have a problem, you bring it to the lowest appropriate level in your chain of command. If he/she can't help, you can then address it to the next level in your chain, and so on. You'll be required to memorize your entire AFBMT Chain of Command by the 8th day of basic. So, why not study it in advance? In AFBMT, when you are ordered to speak with a superior, you must first "report," and use your "reporting statement." This article will tell you what reporting is all about, and how you can be a reporting expert before you even get to basic. Each military branch has a song that they consider theirs and theirs alone, and they are proud of their song. In AFBMT, you'll be required to sing the Air Force Song each morning following reveille (the raising of the flag), and pretty much any time your TI wants to hear you sing it. All of the services have core values -- standards that their members are expected to live by. In basic training, you'll be required to memorize the Air Force Corps Values, and be required to state those values, anytime the T.I. orders you to. If you don't know how to tell time the military way (i.e. 3:00 PM = 1500 hours), this would be a good topic to study in advance. This article will help you understand how the military tells time. If you're like my kids and don't know your social security number by heart, memorize it. Your social security number becomes your "identification number" and you'll use it for almost everything (Privacy Act permitting).